The brusque treatment that Pluto received from astronomers in 2006 has set astrologers searching for the symbolic significance of the outermost planet’s demotion. In the process, there has been a great deal of searching back towards the mythological roots of Pluto. While this approach is certainly valid, I think it’s equally important to trace the evolution of Pluto forward from its discovery—after all, we have several recent symbolic manifestations which can be explored. As you may know, the name Pluto is shared by a Disney cartoon character, introduced the same year that the planet was discovered. Why exactly did Disney name a cartoon mutt after the God of the Underworld? On the surface, the process was innocent enough: the dog was named for the newly discovered planet, but I find this explanation unsatisfying. Cartoon characters generally have names like Elmo, not Wotan. Sponge Bob lives in Bikini Bottom, not Hell. A symbolic analysis of the cartoon dog reveals a deeper layer of meaning, which may help us in our understanding of our attitude towards the planet Pluto. First of all, the association of dogs and the underworld is well known. The hounds of Hell are well established in popular mythology (see, for example, blues legend Robert Johnson’s song Hell Hound on My Trail), deriving from Cerberus, the three-headed dog who guards the gates of the underworld, preventing souls from leaving. So while the cartoon Pluto is named for the god himself, his association is more properly with this canine guardian. 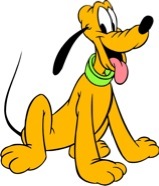 Pluto is Mickey Mouse’s pet dog. Now, a mouse is an odd but not uncommon figure as the protagonist in a cartoon. In the Tom and Jerry cartoons, Jerry is generally seen as the innocent and Tom as the troublemaker, and Mickey himself is clearly a good guy. This is a very peculiar situation, given our typical attitude towards rodents. Mice are seen as pests, as weak annoyances, and the term mouse is derisive when referring to a person, as in the adjective mousey or the old taunt, “are you a man or a mouse?” The larger cousin of the mouse, the rat, is viewed with extreme negativity in Western culture, where a rat is someone who gives up the confidence of his peers (“rats them out”). The image of the rat as self-interested in the extreme also fuels the societal-oriented condemnation, the rat race. We can postulate from the above that the innocent and charming Mickey and Pluto are hiding something of their (or our) true nature. It is no accident that we often choose to anthropomorphize animals, as our nature is also part animal, with all the urges and raw instincts that we see in their unadulterated form in the animal kingdom. But cartoon makers sometimes go a step further and reverse the images, so that the tame house cat is a villain, while the household vermin becomes the hero (Tom & Jerry), the serene and graceful duck becomes a lunatic (Daffy or Donald Duck), and the fierce dog becomes a cute foil (Pluto and Goofy). In the case of Mickey and Pluto, the difficult and dark side of nature is repressed, while the bright and sunny side is emphasized. Mice are suddenly cute, and Cerberus is at worst a difficult house pet. Walt Disney’s own description of the naming of his canine creation seems almost impossibly ironic: "There was a malaise of humanity sweeping across the country. I decided to take Nate's advice and do something fun and creative. The planet Pluto had recently been discovered and I felt it was appropriate to name the pup in its honor." Was no one at Disney’s studio familiar with mythology? What we really see is that the absurdity of reversing the nature of the animals has reached a climax, and so in Pluto’s name we begin to see a deterioration of the situation; information about the shadow side of the cartoon family is beginning to leak through. Note also that unlike his cartoon cousin Goofy, Pluto remains a dog, he is not anthropomorphized, another clue that the situation of idealized cartoon characters is beginning to break down, in that the Hound of Hell is too potent an image to be fully converted to a humanized equivalent. Under the pleasant surface, are not Mickey and Pluto trying to tell us something? In the anthropomorphized mouse, we see modern man reduced to the lower order of rodentia. While Charlie Chaplin and his cohort struggled with the industrial era in Modern Times (1936), Mickey represents a defeated end to the struggle, a passive resignation to one’s fate in the rat race, to being a mouse. He accepts his two-dimensional fate, his safe but dull existence (punctuated by the occasional trip to Disneyland, no doubt). He is in Hades, the underworld, the land of pale shades, and should he try to rally his Martial energy to attempt an escape, he would surely encounter the dark side of the hound that guards his cartoonish fate. If this seems too much of a stretch of the imagination, consider that in the cartoon in which Pluto made his first appearance, The Chain Gang (1930), he is not Mickey’s pet at all, but a bloodhound that chases Mickey after the mouse joins a prison break. While Mickey’s memory of this episode is obviously repressed, it must have it’s unconscious effect, and indeed, Mickey’s personality in these earlier cartoons is more the mischievous prankster than the domesticated mouse he later became. After all, some unknown offense landed him on a prison chain gang—this isn’t the mouse we know from his silent handshakes at the Magic Kingdom! The subsequent integration of (the dog) Pluto into his life has not released the powerful instincts, but has paradoxically led to their repression, seemingly the very opposite of the function of the planet Pluto. Mickey’s world then becomes a fantasy, a simulacrum, and we can sense the tension below the surface every time we watch one of his adventures. Mickey’s world is a mouse trap, and he implies that we too are caught in it, warning us not to try to break free. A very different cartoon character from the underworld is Popeye’s nemesis Bluto (an obvious cognate of Pluto). Bluto more overtly represents dark rage, and he shows signs of being self-aware of his own evil, hence he is represented as a human. It is interesting that he is also sometimes named Brutus, suggesting both betrayal (see rat) and unreasoning stupidity (brute). Thus, Popeye’s struggle with Bluto is more overt and far more healing than Mickey’s passive adventures with Pluto. Popeye will not succumb to a pleasant but emotionally dead world, he is not a mouse, and so he offers us a more optimistic image, that of the hero, one who declares, “I am what I am.” Rather than appropriating and then distorting the animal kingdom in an endless pleasant fantasy, Popeye incorporates nature into himself (in the form of spinach) and uses it to assert his own Martial energy. While Bluto confronted us with our Plutonian side, Disney’s dog led us into a maze of denial and role-reversals, demonstrating that the symbolic energy of Pluto has always been liable to repression and suppression. This suggests that the demotion of the planet is one more step in an attempt to Disnefy our culture, to encourage our denial of instinctual energies (both dark and light) in favor of a pleasant, but cardboard, reality.